Side table "Beistelltisch C-03" - handmade in Germany by Opossum Design - Vejtsberg. 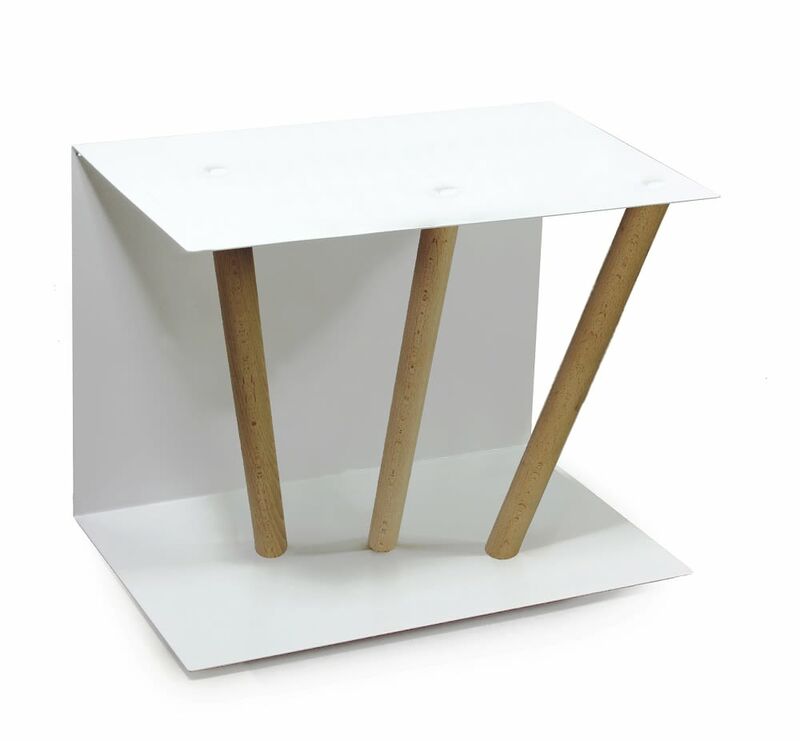 The side table's body is made from very sturdy white powder coated steel. The integrated stabilisers can be ordered made from bamboo / black painted beech wood / sanded & oiled beech wood (= natural appearance) / sanded & oiled oak wood (= natural appearance). Please note that the decorative items shown in the images are not included. The build quality and therefore appearance of this design product is as high as one would expect from a product made in Germany. Unfortunately that is always a bit difficult to convey with images. This design item was created by OPOSSUM Design - Vejtsberg which is a well established German design brand. The brand focuses on rethinking objects that surround us in our daily lives. By refining both function and aesthetics, OPOSSUM Design - Vejtsberg wants to work against the trend of us being surrounded by increasingly interchangeable, short-lived and anonymous products. The brand was founded in 1998 by Heike and Uwe Sinnig in Germany. At the beginning they started in a small garage, now they develop and produce new design gift articles, indoor furniture and interior objects as well as objects for the garden. Many of the designs have received critical acclaim. OPOSSUM Design is a well established German design brand that focuses on rethinking objects that surround us in our daily lives. By refining both function and aesthetics, OPOSSUM Design wants to work against the trend of us being surrounded by increasingly interchangeable, short-lived and anonymous products.